Bubby and Bean ::: Living Creatively: April GIVEAWAY // Win Clothing, Paper Goods, Home Decor & More! 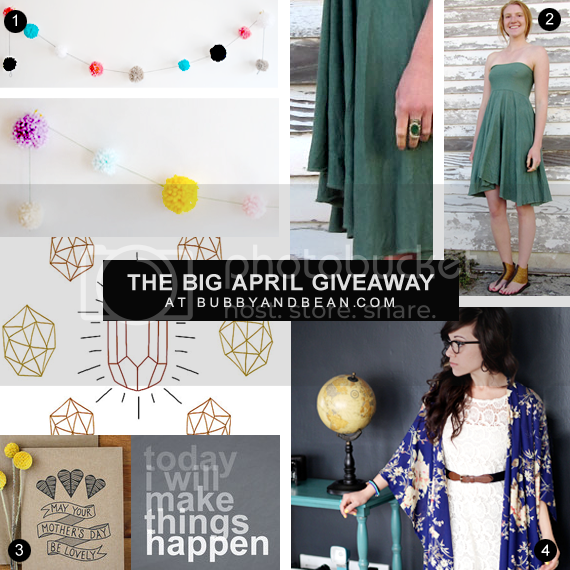 April GIVEAWAY // Win Clothing, Paper Goods, Home Decor & More! Happy Friday! It's time for this month's big giveaway, which features some pretty amazing items from several of Bubby and Bean's April sponsors (and Bubby and Bean Art too!) One lucky reader will win everything you see here, valued at $210. Visit any of the shops from this giveaway (Little Knitty Things // Gaia Conceptions // Bubby & Bean Art) and list your favorite item(s). Favorite any of the shops from this giveaway on Etsy (Little Knitty Things // Gaia Conceptions // Bubby & Bean Art). This giveaway runs through May 2nd and is open to Bubby and Bean subscribers worldwide. The winner's name will be chosen randomly and announced shortly after. IMPORTANT: Please make sure that you check back after the 1st and/or that there is a way to contact you through your entries in case you are the winner. Thanks again to our April sponsors for contributing such fantastic prizes! Good luck! the organic dress is gorgeous! I'd truly love to win. I'd love to win the garland and bubby bean art for Mother's Day! Now Following BubbyandBean on twitter! Also, tweeted as mentioned. My favorite item from Gaia conceptions is the long ankle length skirt. The prints are just what I've been looking for! My favorite item from Bubby and bean is the Let's Go On An Adventure art print. I liked this post in Facebook!! I follow you on Instagram (@littlenostalgia). I follow you on Twitter (@littlenostalgia). I follow you on Pinterest (@littlenostalgia). I'd love to win the shop credit for B&B Art!! The spring pastel pompom garland is so cute! Just tweeted about your giveaway and I follow you on Twitter too! I'm in LOVE with the skirt / dress. I <3 all of the shops on Etsy! I stalk (er, follow) you on Instagram (@2justByou). I'm a fan on fb (justbyou kim). I follow on Pinterest (@justByou). I follow on twitter (@2justByou). I LOVE the Gypsy Short Dress from Gaia Conceptions, but am a fan of all 3 shops! Thanks for the great giveaway!! My most desired prize out of this awesome list would be the organic dress! It looks gorgeous and comfortable. Its simplicity makes it all the more versatile, too. Would love to win the organic dress/skirt ! I would like to win the organic dress/skirt. I'd most like to win the circle skirt from Gaia Conceptions. I follow via GFC. I love the Knitted Neck Short Dress from Gaia Conceptions. I love the You Must Live in the Present Print from Bubby and Bean. the dress sure is pretty! I like the pompon garlands! I'm following via GFC as Marija. The item I'm most excited about is the dress/circle skirt. Following on Blogloving, love the skirt!! win this $210 prize package! I would most love to win the shop credit to BUBBY AND BEAN ART! # 3 love the dress! following on Bloglovin and I'd love the circle dress!! ooo would love to win that dress! I would most like to win the dress. I'd love to win the ORGANIC DRESS/CIRCLE SKIRT! That pom-pom garland is precious! I'd love to win it! I'd like to win the skirt from Gaia Conceptions the most. I'd like to win the skirt/dress most. I love the green dress/skirt! Oh love everything, thanks so much for the chance!! I am a photog & LOVE the #1 garlands to use as a super cute backdrop!! LOVE the whimsical pom pom garland via Little Knitty Things! I love ya'll on fb! I pinned the giveaway image to Pinterest! I love the dress! Thanks for the giveaway! Love the pom pom garland! I would love to win the ORGANIC DRESS/CIRCLE SKIRT for my niece. I love the Brown bear- 6-12 month bear pompom knit hat toque from little knitty things. I'd love the pom pom garland! Really cute! I like the banded migration shirt from Gaia. I follow Little Tree on Bloglovin as Makaela. I follow Bubby & Bean on Twitter as @theindigoshelf. I follow Bubby & Bean on Pinterest as Makaela M.
I follow on Facebook-same name. The Thank You cards would be perfect for our wedding! I'd love the B&B shop credit!